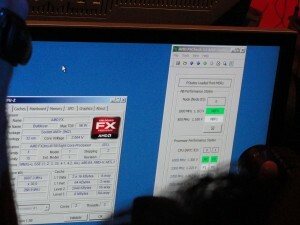 8429.38MHz is the new CPU Frequency World Record claimed by a near-production desktop version of AMD’s FX Bulldozer CPU! Overclockers.com witnessed the event first hand in Austin, TX at AMD Headquarters on August 31st during an AMD FX pre-launch briefing, and the record is set to be confirmed by the Guinness Book of World Records and HWBot.org. The new AMD FX record smashes AMD’s previous best of 7378.25MHz set with a Phenom II 955 Black Edition. Read on below for details on how the record was set, video of the action, what the record means to us, as well as pictures from throughout the demonstration. Is it worth reading on? 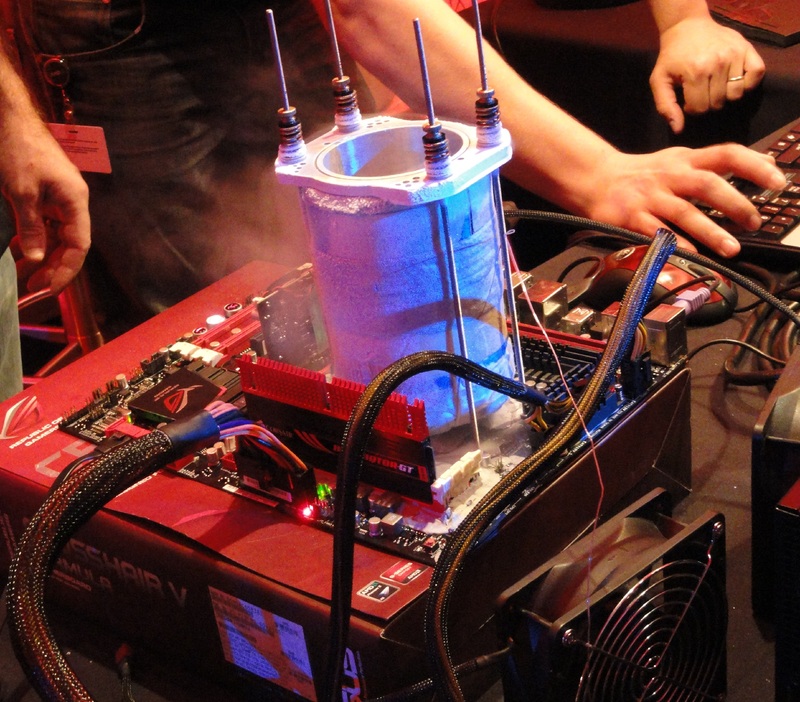 5Ghz for Bulldozer is commonplace with air cooling for under 100 dollars…keep reading! It’s worth saying again folks – 8.4GHz+ at 2.02Volts. Wow! We’ve obtained an exclusive validation screenshot, something you won’t find on any other site at this point so you can see for yourself! One remarkable part of this world record is that it was hit in just a couple days of final testing, with just a few hours of actually going after the record under the most extreme conditions. Those doing the overclocking, Brian Mchlachlan (Chew*) and Sami Maekinen, had also done some pretesting on these chips in the week prior when they found 8 Bulldozer CPUs that would hit 8Ghz on extreme cooling – that confirmed very promising potential with high voltage tolerance and frequency scaling under cold. 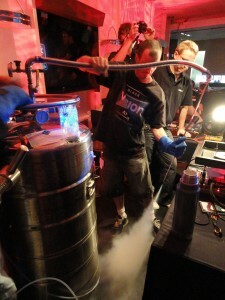 Ultimately, the final run was achieved through a two-stage approach in which a Liquid Nitrogen (LN2) evaporator pot was used on the CPU throughout, while the final record fell using Liquid Helium (LHe). 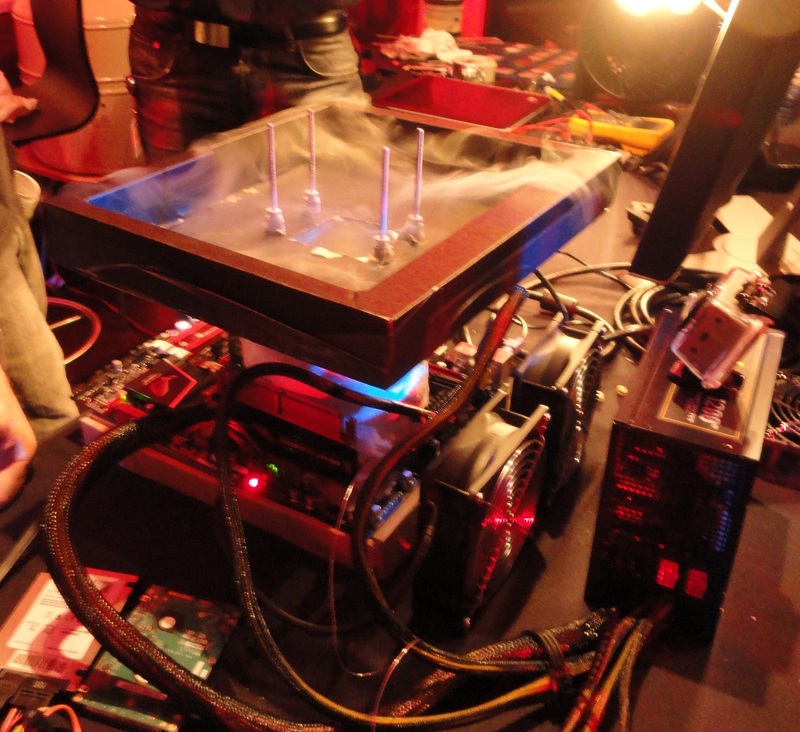 Check out the following video to see the LHe overclocking in action! In the first stage, LN2 was poured from a thermos into the pot to cool the Bulldozer processor down to -190C. Once at that temperature, we were observing results of 7.8GHz at 1.9V and AMD felt this Bulldozer chip was promising enough to break out the REALLY cold stuff, Liquid Helium (LHe). 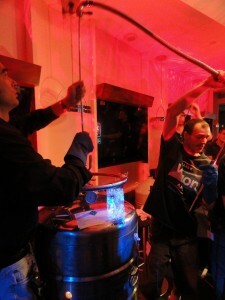 LHe is the ultimate in cold for subzero cooling; it boils just a few degrees Celcius above absolute zero. It is so cold in fact, that after pre-cooling to -190C, they had to ensure all the LN2 had boiled off before switching out – the liquid Helium would freeze the Liquid Nitrogen in the evaporator and interfere with optimal heat transfer! 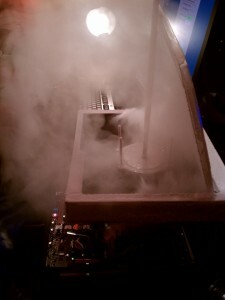 In the second cooling stage, an attachment designed by Aaron Schradin was added at the top of the LN2 evaporator to secure the pipe which would provide a constant flow of LHe into the evaporator, and a nozzle was affixed near the inner base of the container which encourages turbulence as the LHe enters. So cold that it boils violently on contact with the base of the evaporator, a constant plume of LHe fog erupts from within as you can see from all of the pictures. 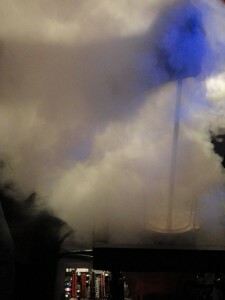 The fog itself is cold enough that they rigged a motherboard box to fit on top of the evaporator and used fans to blow the fog away from the motherboard in an attempt to minimize the condensation that forms on the chilled components – that is why the cooling apparatus is largely obfuscated in many pictures. Still, unless you are intimately familiar with subzero overclocking like I am, or you just get excited by new records like I do, you may be asking what a CPU Frequency record matters to Joe Sixpack? Don’t let anyone – or any marketing – fool you. This record isn’t going to change the way you compute daily, it isn’t going to mean you hit 6GHz on air, and it isn’t confirmation of what other benchmark performance we should expect to see from Bulldozer. We’ll be bringing you the benchmark performance, air cooling OC results, as well as more subzero results soon, but you’ll have to stay tuned until we can bring you all of those tests in the not too distant future. All that said, results of “well beyond 5GHz” on air were claimed on cooling solutions priced below the $100 mark! The sign didn't say "Do Not Touch"
But what does it really mean? The world record feat brings us a lot of excitement about the possibilities for Bulldozer, but we still should be asking what it really means. In recent years, the game of high frequency records was the sole domain of Intel processors, and only about 20 of their chips have ever recorded tipping the scale at over 8GHz though hundreds of overclockers have tried for years. But even Intel hasn’t had any current generation contenders on this playing field; Intel’s best record was set just last month on August 12th, 2011 when TaPaKaH hit 8308.94MHz on an old Cedar Mill chip. That still puts Intel over 100MHz behind AMD’s new record, and the latest AMD FX chips aren’t even available at retail yet. The old Cedar Mill record is worth looking at closer now despite the fact no self respecting person in the modern day hardware game would be caught with one in their rig. 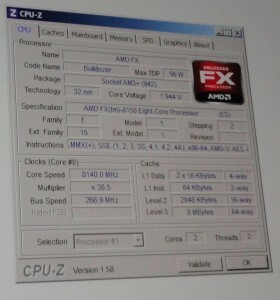 Intel’s 8.3GHz mark on Cedar Mill is rather telling in regards to what AMD’s Bulldozer holds in store for overclockers. With Cedar Mill chips half a decade old breaking records as recently as last month, and Bulldozer breaking the World Record before it hits market – without any doubt this is only the beginning for Bulldozer. 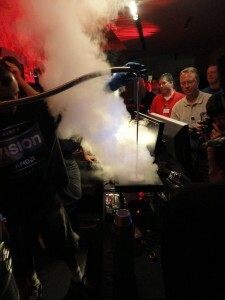 AMD will be the first to hit 8.5GHz, and it will happen before long, the only question remaining is which overclocker will hit it first!? Looking forward to the horizon, what about 9GHz? Yesterday most people would have told you that isn’t realistic. Today many would likely still say I’m stupid for posing the question. But I will tell you this. 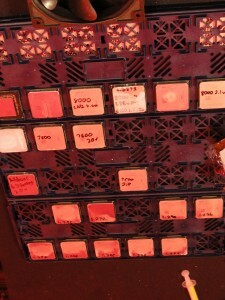 Pre-production chips historically only scratch the surface of what the architecture is capable of. 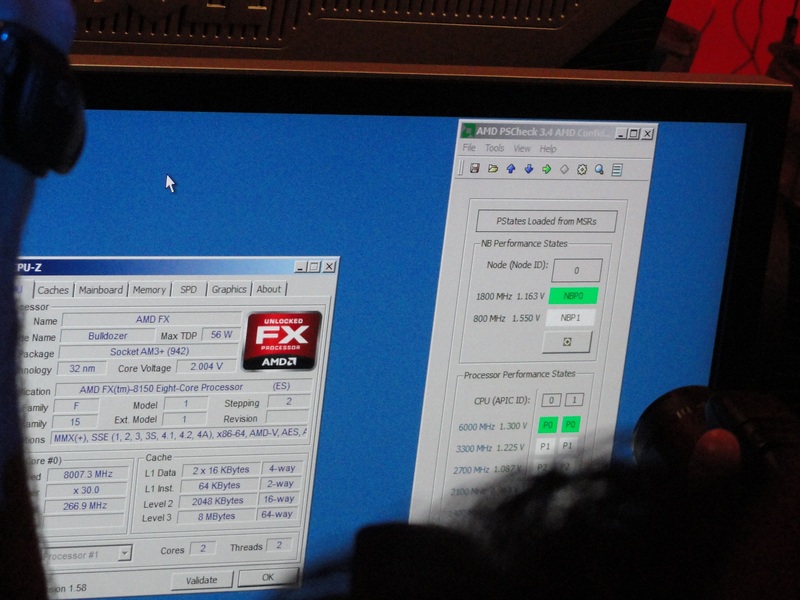 Given time as fabrication processes and yields improve while more people get their hands on more chips, we could hear reports of AMD seriously flirting with 9GHz soon enough. Granted however, the frequency scales with cold especially well, and we were watching liquid Helium which is as cold as it gets… But given time and liquid nitrogen, I expect the overclocking community will continue pushing these boundaries as the architecture matures! Bulldozer is in fact built like a Bulldozer. It will take a lot of abuse and keep on pumping! Now keep in mind the voltages discussed here were under extreme cooling – voltage tolerance under subzero cooling is considerably higher than ambient cooling. However, even on subzero hitting voltages of 2V, 2.1V, or 2.2V is especially high – those are definitely in the range where typically on Phenom II the chip could very likely never run again. 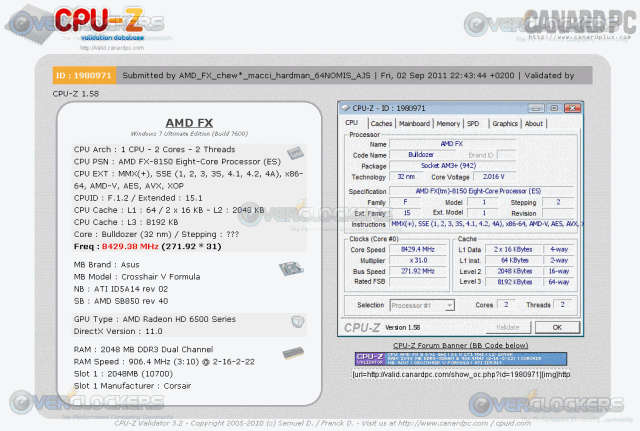 The previous AMD record of 7378MHz was hit on only 1.88V. Its safe to say Bulldozer can handle quite a bit of extra voltage compared to what we may have become accustomed to! Once you get your hands on one, watch your temps as always, and make moderate increases while confirming frequency is scaling with the increases. Do that, and you are likely to have a hard time killing one while finding a lot of headroom for your overclock. In passing conversation, Brian and Sami mentioned doing 5Ghz on air running fully multi-threaded benchmarks. Finally on the scaling perspective, the results are confirmed that like the Phenoms, Bulldozer has no cold bug and the colder you can take it the higher the frequency and voltage tolerance climbs. 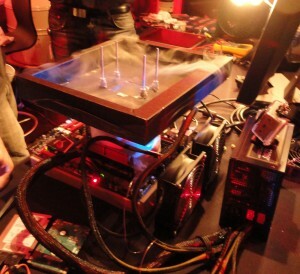 In this sense, Bulldozer should receive a warm welcome from the overclocking crowd. Unlocked multipliers come standard; it’s highly tweak-able with all the settings you’ve grown accustomed to from Phenom, and it likes strong cooling so you’ll get additional headroom from your air or water cooling investments! At this point we will leave you with that, as sometime soon we’ll have further testing and the ability to talk about results you want that aren’t mentioned here! Ask question or make comments directly below this article, as I’ll be actively joining in the conversation. 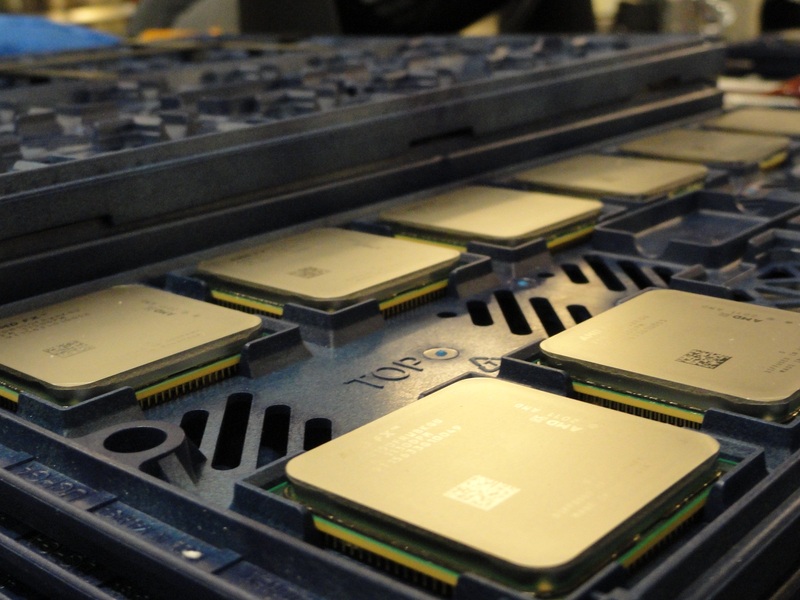 Also you can read AMD’s own press release, or review our AMD Phenom Overclocking guide that also applies to Bulldozer so you are ready when these chips hit the streets! 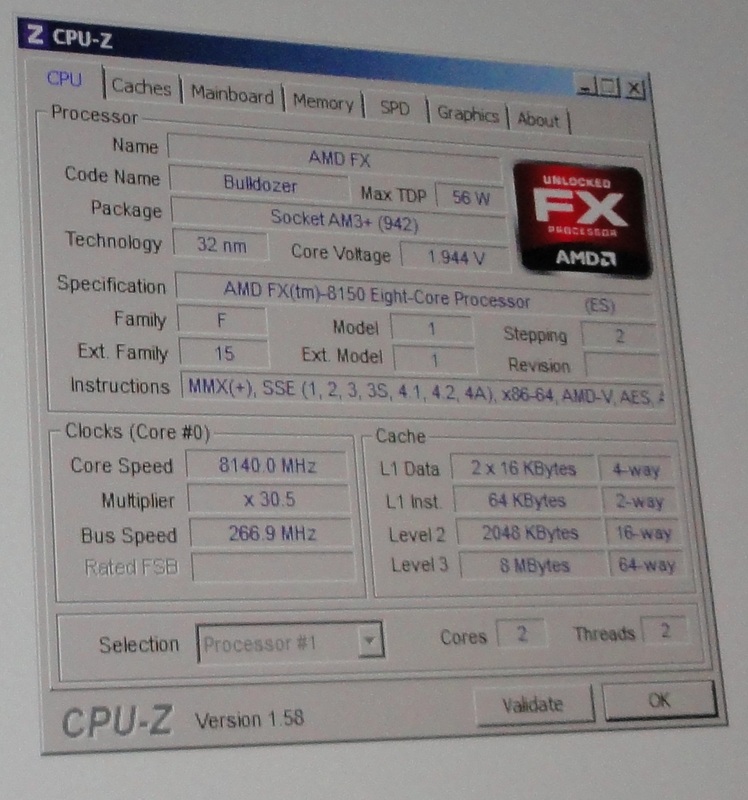 In the forums, find constant updates on Bulldozer Rumors, AMD FX Bulldozer Socket questions, and the latest AMD Bulldozer CPU discussions. As soon as the official release date is announced you’ll hear it from us! 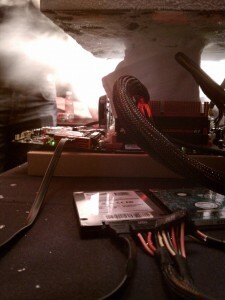 Yup, 5Ghz on air consistently is the word, though there wasn't much air overclocking going on at the demo. Should be interesting! I only wish I could get that entire tray of Bulldozer's as a birthday gift. That sounds very promising! 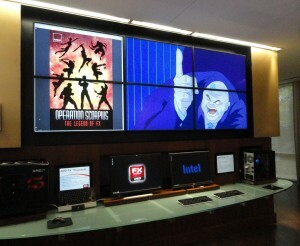 That would be excellent news for AMD to have a 6-core that could run daily type o.c. in the 4.6Ghz and up to 5.0Ghz range. Can't wait to start discussing that either, as I knew our audience would look to that very quickly - it took all of a few minutes for someone to bring it up! Does anyone have any of that information...........? Now only a short time before other benchmarks start rolling in, let's hope for some competition! 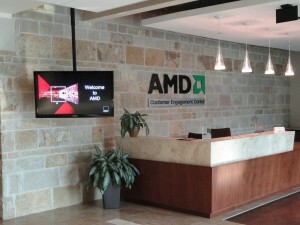 Earthdog, we had a great opportunity to be briefed on the architecture and performance from AMD - only about 20 sites were invited to get an inside look and ask questions as they walked us through what to expect in preparation for launch. 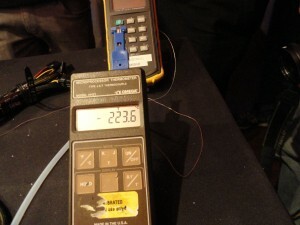 As launch draws closer, you'll be hearing more official word from us as well as other sites on all information aside from the overclocking demonstration part of our visit. I can't wait to get my hands on one and see what it can do. This is what I've been waiting to hear and defiently need to know how it stacks up to other CPU's with Super Pi and WPrime. If Bulldozer is close to as efficient as SB, then the higher GHz could make up for any possible lack of efficiency for benchers. Good point Matt! If they do improve their clock for clock performance to be at SB or just behind, those clock speeds, even on LN2, would likely more than make up for it. Chew* is going to make it difficult for me.